Bus Route 10 is one of several that connect the city of Hamilton to the historic town of St George. The others are 1, 3, and 11. Buses on the this route leave the Central Terminal in Hamilton and head north out of the city on Cedar Avenue, passing the WER Joell Tennis Stadium. Buses then head east along Marsh Folly Road/Palmetto Road, going by the Bermuda National Sports Centre, and then onto North Shore Road, close to the Ocean View Golf Course. From here the route is the same as Bus Route 11. Buses travel along North Shore Road until they reach the village of Flatts. This beautiful village surrounds Flatts Inlet and is home to one of Bermuda’s most popular tourist attractions; the Bermuda Aquarium, Museum & Zoo. Before you go in, wander over to the nearby bridge and look down at the tidal waters rushing to and from Harrington Sound. 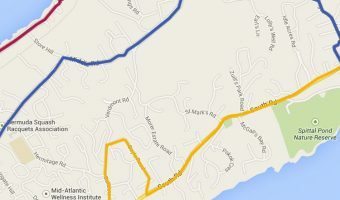 After leaving Flatts, the route goes into Hamilton Parish, passing Shelly Bay, Clear View, and Abbot’s Cliff Park, before reaching Bailey’s Bay. Here you’ll find the Swizzle Inn, the Grotto Bay Beach Resort, and Blue Hole Park. Buses then cross the Causeway, stopping at LF Wade International Airport, before carrying on to St George. St George was Bermuda’s original capital and one of the oldest settlements in the New World. It oozes historic charm with many period buildings still standing. Some, like Tucker House, Stewart Hall, and the Globe Hotel, have been set aside as museums, but many others are functioning houses, pubs and restaurants, churches, and shops. Buses on Route 10 depart every hour from Hamilton. The first bus of the day leaves the capital at 7.15 am. The complete trip from Hamilton to St George takes around 50 minutes. The travel times from Hamilton to the destinations served by this bus route are shown in the table below. The map below shows the route taken by buses on Route 10. Click here for an interactive map showing points of interest and more.